This classic stew uses boneless beef short ribs which I think is superior to any other cut of meat for stew. In a large bowl mix the salt, pepper, paprika and flour then toss the meat to coat. Heat a 5 quart Dutch oven or heavy pot to medium high, then add the butter. In two batches, brown the coated meat on both sides and transfer to a plate. Be careful not to burn the flour on the bottom of the pan. Remove last batch of meat and add the onions and scrape the bottom of the pan. Add the tomato paste, stir, then add the beer. Add back the browned meat and any accumulated juices from the plate. Add the bay leaves and the water. Cover and put into a 350 degree oven for approximately 2 1/2 hours or until the meat is tender. Stir in the potatoes the last hour of cooking. Remove from oven and stir in the peas and let it set until the peas are hot. Add 1 teaspoon Kosher salt, and 1/4 cup Ocean Spray cranberry jelly, a combination which brings depth to any beef stew. 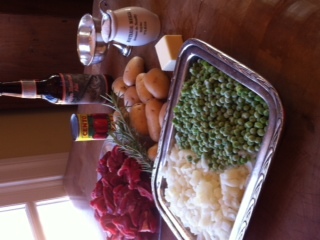 This entry was posted in Recipes and tagged beef, Make ahead, stew. Bookmark the permalink. Yum! Can’t wait to try this one, too!